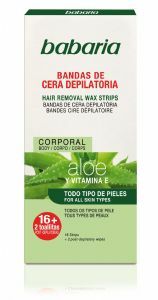 Babaria Aloe Vera Hair Removal Wax Strips for the body contain Aloe Vera and Vitamin E and are suitable for all skin types. They provide long lasting results (up to 28 days) as they remove hair at the root. They are effective on short hair and leave the skin soft and moisturised. Contains two post wax wipes to remove any residue and leave the skin smooth. Triethylene Glycol Rosinate, Glyceryl Rosinate, Polyethlene, Parfum, Ricinus Communis Seed Oil, Pentaerythrityl Tetra-di-butyl Hydroxyhydrocinnamate, Hexyl Cinnamal, Linalool, Tocopheryl Acetate, Alpha-isomethyl lonone, Helianthus Annuus Seed Oil, Aloe Barbadensis Leaf Extract, CI77891, CI47000, CI61565.